During the prototyping and fabrication phases of a product, vacuum forming can speed up the process with rigid parts cut from anything like wood or metal and shaped. If for any reason you have any questions or comments about our vacuum forming services, feel free to give us a call at 1-800-Met-L-Flo or fill out the form to the right and a representative will respond shortly. 1 service to consider utilizing in combination is direct digital manufacturing or 3D printing with vacuum forming to rapid prototype parts and customized parts. The most common benefits of vacuum forming comes from the prototyping and fabrication phase of a product’s development. 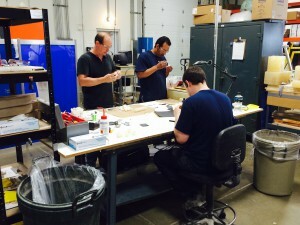 Our experienced staff of fabricators and engineers can help solve problems before the parts go into production so it’s a great idea to consult with them before taking that final step. A single sheet of vacuum forming material can create several pieces to test, modify and refine. Reducing the cost of modeling multiple iterations of the same piece that could have flaws or variations. The vacuum forming process utilized by Met L Flo Inc. incorporates a sheet of plastic material of varying thicknesses, dependent on the application, that is carefully heated until the sheet is pliable for forming. The vacuum form services provided by Met-L-Flo are considerably more affordable compared to our competitors and our experienced staff of fabricators and engineers can help solve problems before the parts go into production. Trust Met-L-Flo for all of your vacuum form or prototyping needs. If for any reason you have any questions or comments about our vacuum forming services, feel free to fill out the form to the right and an associate will respond shortly or give us a call at 1-800-Met-L-Flo to speak with a knowledgeable representative.